LEGION OF THE DAMNED - SLAVES OF THE SHADOW REALM LTD. EDIT. (CD+DVD DIGI) | Online Shop | Wizard LTD. Album: "SLAVES OF THE SHADOW REALM LTD. EDIT. 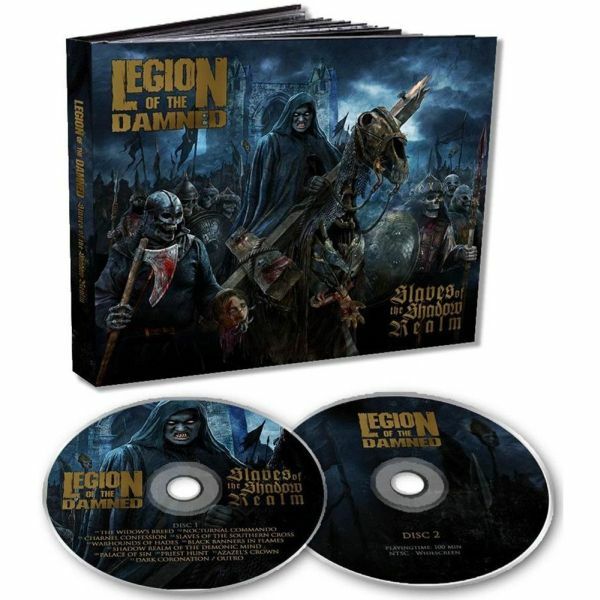 (CD+DVD DIGI)"
If there is a band that&apos;ll break your neck from the sheer force of their music, it must be be LEGION OF THE DAMNED! The Dutch thrash outfit, flirting with death and black metal, unleashes their seventh milestone Slaves of the Shadow Realm. This monster resembles a colossal, smooth and blackened monolith. Four years after the much-praised Ravenous Plague, the shredding four piece returns with “fifth band member” / producer Andy Classen and presents an album that merges the unadulterated fury of the early LOTD years with the sophistication of a veteran band. ‘Nocturnal Commando‘ is a typical old school rager, whereas the brilliant ‘Slaves of the Southern Cross’ is reminiscent of the band’s stoic groovy band classic ‘Into the Eye of the Storm‘ before erupting into ballistic melody infusions. The perfectly balanced ‘Dark Coronation‘ closes an amazingly varied and at the same time catchy beast of an album. Told ya: neckbreakers!